Glasgow City Council in Scotland is turning to open innovation for ideas on how to minimize waste and pollution through recycling and re-using materials. The city’s chamber of commerce has launched an initiative on Circle Lab, an online platform that challenges citizens to improve sustainability. It is hoped that people from all over the world will contribute their ideas. The principal area of focus will be on how local businesses can reduce the amount of litter and waste (such as food, plastic and construction waste) that is left behind after major events. According to estimates more than three million people attended conferences and major sporting and cultural events in Glasgow in 2017. And the amount of waste that was generated was considerable. Most likely the numbers will increase in the near future, especially this year with the UEFA European Championships, a multi-national soccer competition that will attract sporting fans from all over Europe. 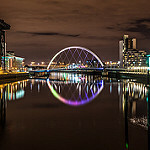 “…the Circle Lab Challenge provides a fantastic opportunity to generate innovative ideas which will help Glasgow achieve its ambitions of becoming one of Europe’s most sustainable cities by 2020,” commented David McDonald, the deputy leader of Glasgow city council in an interview with The Times newspaper. At the time of writing this post 20 ideas have been submitted and there are five days left for submissions. If any ideas are selected, they will go through an incubation process locally. For more information about the open innovation project and to submit ideas and read those already proposed, click here.